So hopefully, you’ve learned from my contacts debacle that more expensive isn’t always better. True, you’re probably going to get a more detailed looking set of lenses if you throw $300 into them, but ask yourself: how often am I really going to be wearing these? If you’re Hannah Hindi, who goes to conventions most weekends, you’re getting your money’s worth. If you just want to go as Alice for Halloween, you’re probably better off investing in something cheaper. And luckily, I have a list of options to consider! Yay! These are probably the cheapest you’re going to find, and you can’t go wrong with free shipping. The good thing about these is that they’re unmistakeably topaz in colour; a lot of contacts tend to be reddish or orange. THE GOOD: The colour (and price) is right. 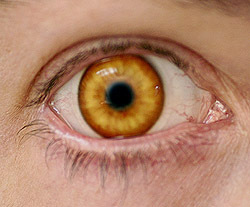 THE BAD: Contacts usually have other colours or starburst patterns in them. These don’t, so they may look a little flat. They also only have a 90 day lifespan, but I guess you can’t expect much when you’re paying less than $25. 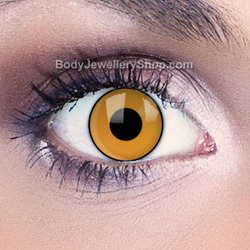 Like the pumpkin eye lenses, these are the perfect topaz colour. However, they have the patterning I talked about, which the others lack. Unfortunately, they don’t come in prescription strength — so if you’re half blind, like me, they may not be the best option. THE GOOD: This comes with a whole care kit! Along with your contacts, you get lens solution AND a case to store them in. THE BAD: As with most Halloween contacts, they’re bound to look a little unnatural. You’re not going to get those “are those your REAL eyes? !” double takes unless you spend the big bucks. Like the others, they also don’t come in prescription strength. Rumour has it that these were the contacts they actually used in the first Twilight film, which they later enhanced with special effects. These are the most popular Cullen lenses. When most lenses are advertised as “Twilight” ones, take a look at the sample picture — you’ll notice that they’re just selling you Amber Ambition under a different name (and higher prices)! THE GOOD: I own these — they were my first pair — so I can vouch for their reliability. They’re comfortable, too. And they come in prescription grade! THE BAD: They’re patterned almost exactly like the Twilight New Moon lenses, but they’re a darker colour. They’ve got a more orange tint to them, so the colour isn’t as accurate. However, they’re VERY noticeable, and there won’t be any mistaking what look you’re going for. See for yourself. That isn’t me, but the picture is great! Okay, so these are way more expensive than the others, but I thought I’d offer a range of prices. And if you WANT something that’s higher quality, then you should know where to look, right? These lenses are identical to the ones the Hillywood Show cast wears, so I’m fairly sure this is where they got them from. Compare for yourself. THE GOOD: They photograph extremely well, you can’t see your natural eye colour through them at all, and they’re the most accurate lenses you’re going to find, bar none. They’re also made in your prescription and customizable. Don’t like that brown ring around the edges? It’s gone! Want a thicker black edge? Why didn’t you say so earlier! Best of all? These are handpainted over white lenses, so they’re guaranteed to perfectly cover ANY eye colour. THE BAD: The price. Yes, they last a long time — years, even. Yes, they look amazing. But it still stings to spend $125 per lens, plus $20 per lens if you need a smaller diameter, with shipping on top of it. Ouch. And there you have it. Any one of these sets would be great for an Alice costume. Some are better than others, of course, but it’s up to personal preference and what you can afford. And if you buy any of these lenses and want to show them off or submit a review, feel free to e-mail me! i bought the “Twilight New Moon” Contacts and they are far from being right for the role! they are much darker, almost orange, than they apear in the picture. If you have naturally dark eyes they are even more so. Also, they don’t last long before becoming uncomfortable to wear….just my two cents! Next So cute! Check out Kelli as Alice!